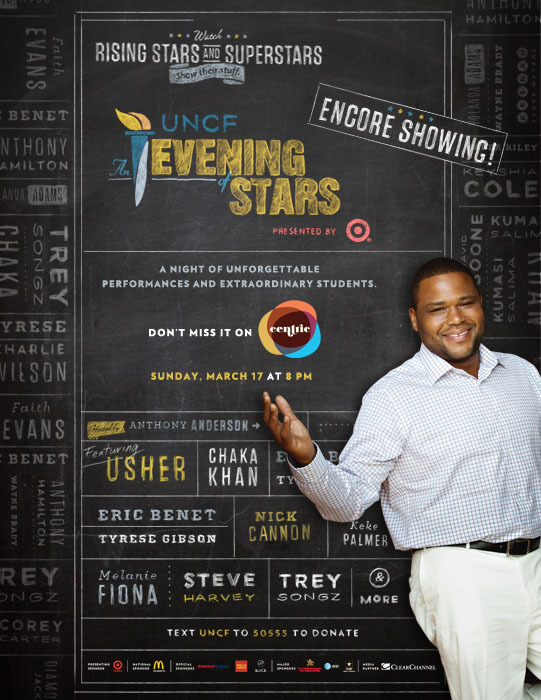 Back by popular demand, I want to share with you that Centric TV will be airing UNCF An Evening of Stars this Sunday, March 17th at 8pmET in an Encore Performance! Please spread the word . .. tell your communities, colleagues friends, and families to tune-in, watch and make a difference in a student’s life. The program is one of the best yet, combining music-industry headliners like Chaka Khan, Yolanda Adams, Charlie Wilson, Anthony Hamilton, Trey Songz, Steve Harvey, and many more, with star students whose education has been made possible by UNCF, making the program a high-voltage celebration of the best in music and the best in education. There’s our young host, Anthony Anderson of NBC’s Guys With Kids. You won’t want to miss Anthony’s comic reunion with his high school mentor, Chaka’s amazing performance, the moment when Usher presents a scholarship to high school senior Ammon Lyle, or the dynamite show-opening duet that Yolanda does with Wiley College student Diamonique Jackson. Tune in and help us spread the word and follow us on Facebook, Twitter and YouTube. UNCF An Evening of Stars® shines a national spotlight on our work. The performers and presenters are great. The “rising star” students are even greater. Sunday, March 17, 8:00pmET on CENTRIC.